In October 1962, the Cuban Missile Crisis ended and the world was saved from falling into a nuclear war. In order to prevent this risk in the future, the United States and the Sovjet Union established a direct communication line between their two capitals in August 1963. 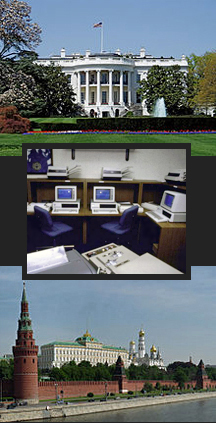 This Washington-Moscow Hotline became one of the most famous top level communications systems in modern history. In popular culture, the Washington-Moscow Hotline is often called the Red Phone, and therefore many people think it's a telephone line, with a red phone set on the president's desk. However, this is false: the Hotline was never a phone line, but instead set up as a teletype connection, which in 1988 was replaced by facsimile units. Since 2008 the Hotline is a highly secure computer link over which messages are exchanged by e-mail. Given the growing threat of a nuclear war, leaders in Washington and Moscow realized already in 1954 that a direct line of communications between their two nations was needed to prevent such a disaster. The Soviets floated the idea publicly for the first time that year, and in 1958 the United States proposed that both nations take part in the Conference of Experts on Surprise Attack in Geneva, Switzerland. Also in 1958 the political economist and nuclear strategist prof. Thomas Schelling proposed the idea of a hotline between both super powers. A direct phone line also featured in the novel Red Alert by Peter Bryant from the same year. Based upon this novel was Stanley Kubrick's 1964 film Dr. Strangelove, both showing how a nuclear war breaks out because of bad communications. In 1960, Jess Gorkin, editor of the magazine Parade, published an open letter in his magazine to President Dwight D. Eisenhower and the Soviet leader Nikita Khrushchev, concluding with: Must a world be lost for want of a telephone call? However, the military and diplomats of the State Department didn't like the idea of the president talking behind their backs with the Russians and reportedly objected the proposal of a direct line. During the Cuban Missile Crisis in October 1962 it clearly came out that the existing ways of communicating between Washington and Moscow were too slow for the events happening. 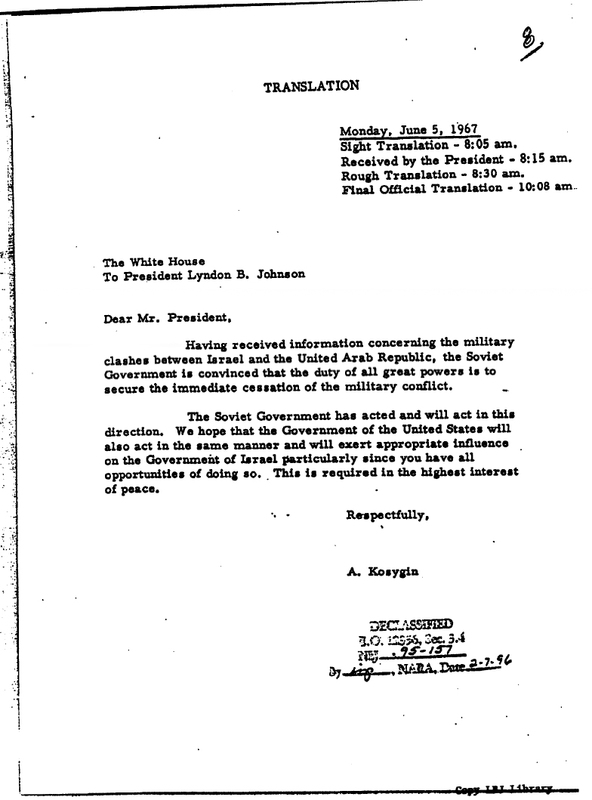 It took Washington nearly 12 hours to receive and decode Khrushchev's 3,000 word initial settlement message. By the time a reply had been written and edited by the White House, Moscow had sent another, tougher message. Under severe time pressure, both leaders ultimately decided to communicate through the media. After the crisis was resolved, the hot line proposal became an immediate priority. After some negotiations, the United States and the Sovjet Union signed an agreement about establising a Direct Communications Link on June 20, 1963 in Geneva. The official American name for the Hotline is Direct Communications Link (DCL), but US technicians often call it MOLINK, being a military style abbreviation for "Moscow-link". 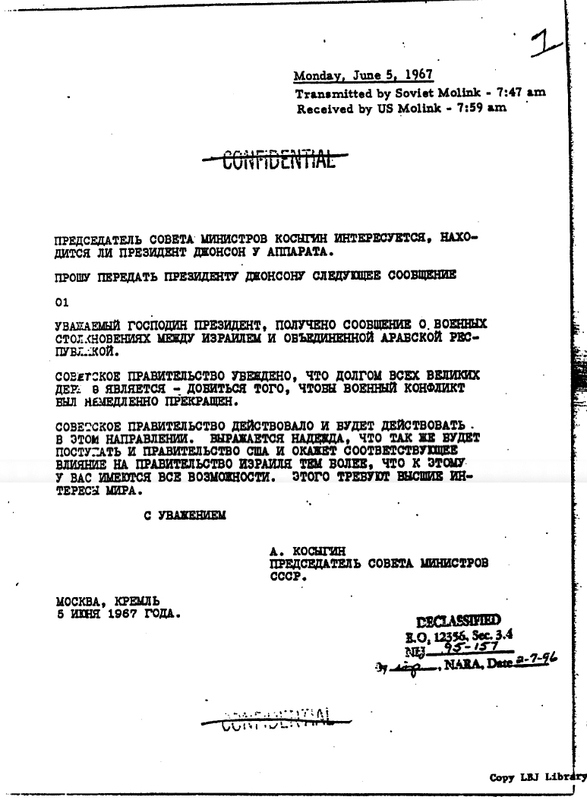 On July 13, 1963, only a month after signing the agreement, the United States sent four sets of teleprinters with Latin alphabet to Moscow for their terminal. This was done via US ambassador Averell Harriman's plane. Another month later, on August 20, the Soviet equipment, four sets of teleprinters with Cyrillic alphabet, arrived in Washington. The cipher machines for encrypting the Hot Line messages came from Norway. According to the agreement, all these machines should be accompanied by a one years supply of spare parts and all the necessary special tools, test equipment, operating instructions and other technical literature. in the Central Telegraph Bureau in Moscow. In the foreground we see the East German T-63 cyrillic teleprinter. 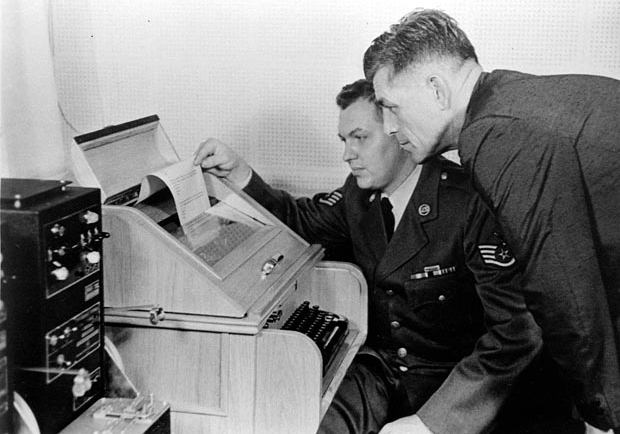 The new Hotline became operational on August 30, 1963, by transmitting the first test messages. Washington sent Moscow the text The quick brown fox jumped over the lazy dog's back 1234567890, which is a so called pangram of all letters and numbers of the Latin alphabet. The Soviets sent back a poetic description of Moscow's setting sun. This cable connection was for the political communications, but appeared not fully fail safe: the cable was accidently cut several times, for example near Copenhagen by a Danish bulldozer operator and by a Finnish farmer who plowed it up once. Besides this wire line link, there was a full duplex teletype radio circuit, routed from Washington via Tangier (Morocco) to Moscow. This was for service communications and served as a back-up. In Moscow, the terminal of the Hotline was supposed to be in the Kremlin, somewhere next to the office of the prime minister. However, Soviet leader Leonid Brezhnev once told a group of Moscow-based American journalists, that their terminal was on the opposite side of Red Square, in the Communist Party headquarters. The Russian terminal was manned by civilians, the American one by the military. 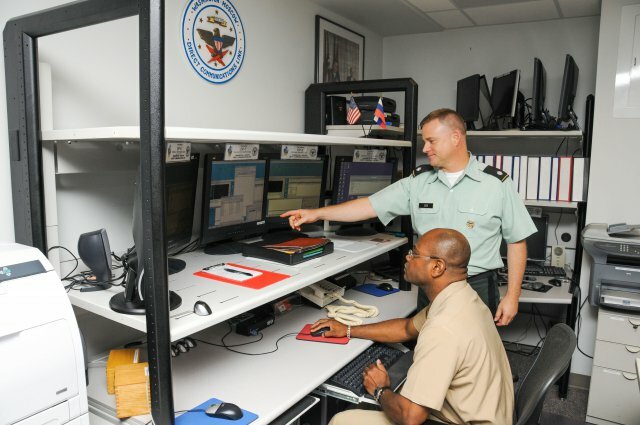 The primary US terminal is at the National Military Command Center (NMCC) in the basement of the Pentagon. There, the Direct Communications Link is a joint staff operation under the control of the Joint Chiefs of Staff J-3 Operations Directorate. The NMCC is responsible for routine testing of the Hotline and for the receipt, transmission and translation of the messages by highly qualified translators. The terminal is manned by six teams of two man each, working in 8-hour shifts and led by a commissioned officer acting as Presidential Translator (PT). For the routine shift operations, the Hotline personnel falls under the command of the flag officer in charge of the NMCC. But when a real message from Moscow arrives, the doors of the terminal room are closed and locked and the personnel becomes subject directly to the president himself. When in June 1967 the Soviets sent their first message, secretary of defense Robert McNamara found out that the Hotline ended in the NMCC, instead of at the White House, as he had expected. McNamara ordered a quick patch from the Pentagon to the White House, which was later formalized by installing an ancillary terminal in the military communications center of the White House Communications Agency (WHCA) in the East Wing basement. 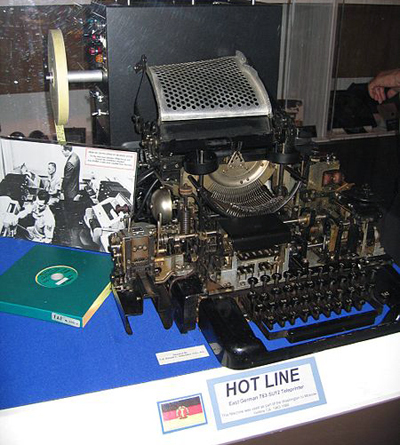 From there, incoming messages from the Hot Line were sent to the Situation Room under the West Wing, first by pneumatic tube and later, after computers were installed in both rooms, by data transmission. Another Hotline terminal is located at the Alternate National Military Command Center (ANMCC), which is situated in the Raven Rock Mountain and serves as a back up facility for the Pentagon. This terminal has the capability to serve as an alternate center for originating and receiving messages. The ANMCC terminal is manned and operated by NMCC personnel, which is also responsible for the periodic testing of this terminal. According to a 2013 report, the Hotline also has a link to the State Department. In a paragraph classified as Secret of the 1985 presidential directive about the operation of the Hot Line, which in the meanwhile has been declassified, it was said that at the sole discretion of the president, additional locations for access to the Hotline may be established. The existence of these sites should be classified as Secret. as photographed in the National Cryptologic Museum of the NSA. At the left we see a green box containing the key tape. Contrary to the myth of a phone line, the Washington-Moscow Hotline has always been for record communications. The idea behind this is that a telephone link could increase the possibility of misunderstanding rather than eradicate it. In times of crisis, mistakes come at a high price. Exchanging written messages gives both parties time for reflection and responding after deliberation. The telephone does not allow this latitude, but on the contrary compels a response of some sort, which can result in a misguided reply or a misunderstood answer. Another reason for the Hotline not being for phone conversations was of technical nature: in the sixties it was hardly possible to realize voice encryption strong enough for top level communications. From the mid-seventies some better techniques were developed, but these were secret national algorithms, which of course couldn't be shared with the Soviets. Unclassified commercially available voice encryption was hardly secure. - Teleprinters with Latin alphabet: Model 28 ASR, made by the Teletype Corp.
- Teleprinters with Cyrillic alphabet: T-63 SU12, made by VEB Messgerätewerk Zwönitz in East Germany, based on the earlier Siemens T-37 teleprinter. 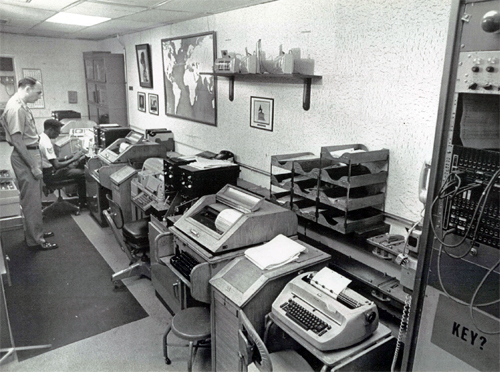 The Washington-Moscow Hotline terminal room in the NMCC at the Pentagon, 1966.
two black ETCRRM II encryption machines in the middle, and top left a T-63 SU12 teleprinter. This arrangement is mirrored at the right side of the room. 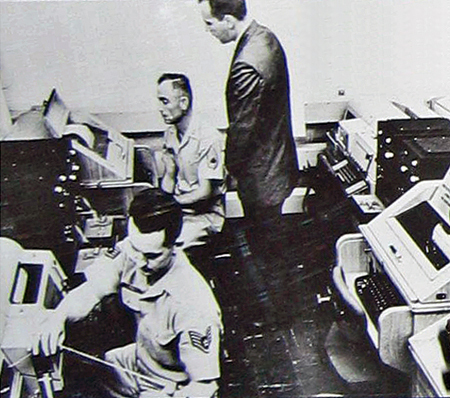 As we can see by comparing the previous picture with the next one, the Hotline equipment in the Pentagon was rearranged, and maybe also replaced to another room, after 1966. Maybe this happened in 1967, when defense secretary McNamara ordered that the Hotline should be extended to the White House. and four ETCRRM II cipher machines (black). With the new teletype and encryption equipment, installed in 1980. 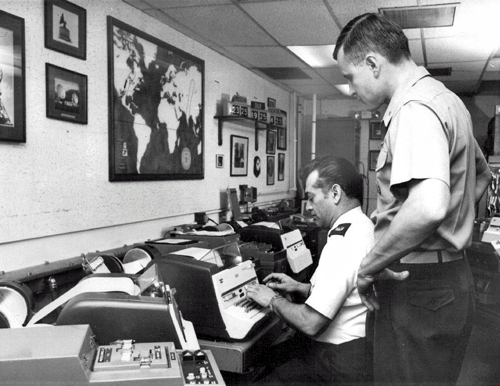 In the foreground we see a Siemens M-190 cipher machine. From the beginning, the confidentiality of the messages through the Washington-Moscow Hotline was assured by encrypting them using the one-time tape method, which has been proved unbreakable if used correctly. The encryption of the teletype transmissions was realised by an Electronic Teleprinter Cryptographic Regenerative Repeater Mixer II, short ETCRRM II. 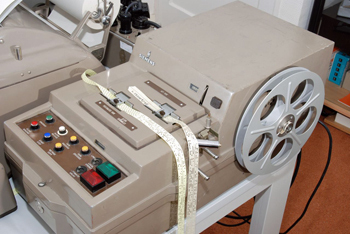 As one of many one-time tape machines sold by commercial firms in those days, this one was produced by the Standard Telefon og Kabelfabrik (STK) in Oslo, a Norwegian subsidiary of the American telecommunications company ITT. It was also commercially available for about 1000,- USD, so for securing the Hotline, neither party had to disclose any of their own secret cryptographic methods. The ETCRRM II used the Vernam stream cipher method, in which plain text message is eXclusively OR'ed (XOR'ed) with a random stream of data of the same length to generate the ciphertext. Once a message was enciphered the keytapes were destroyed. At the receive end, the process was reversed to decode the meassage, for which an identical keystream tape was needed. In 1980 the ETCRRM II was replaced by the German Siemens M-190 cipher machine, which also uses the Vernam principle for one-time tape encryption. This device stayed in use until the teletype connection was terminated in 1988. According to the agreements, each country prepared the keying tapes used to encode its messages and delivered them, through a courier, at their embassy in the other country, from where they were brought to the counterpart's terminal. So, the keys used for encrypting the messages sent from Washington, were brought to the American embassy in Moscow, who delivered them to the Russian hotline terminal. In the US, the key tapes were provided by the Office of Communications Security (now: Information Assurance Directorate) of the NSA. Just imagine the logistics needed for providing not only the Pentagon and the White House terminals, but also the American embassy in Moscow with these key tapes every single day! On September 30, 1971, the United States and the Soviet Union signed an agreement in Washington to modernize the Hotline. The primary cable link was replaced by two satellite circuits: the United States was to provide one circuit via the commercial Intelsat IV system, with satellites in a geosynchronous orbit. The Soviet Union would provide another circuit via four satellites of their Molniya II system on a highly elliptical orbit. This modernization program started in 1971 and, after four years of testing, the satellite link finally became operational on January 16, 1978. This link provided more flexible communications and made the Hot Line less vulnerable than the original landline. The teletype circuit over the undersea and land line cable was retained as a backup to the satellite links, but the teletype radio circuit from Washington over Tangier to Moscow was terminated. Maybe it's because the 1971 agreement says: "The two circuits shall be duplex telephone band-width circuits (...), equipped for secondary telegraphic multiplexing", that some sources erroneously say that in the seventies a telephone capability was added to the Hot Line. Both in the United States and in the Soviet Union satellite earth stations were equipped for the Hotline transmissions. For the signal of the Russian Molniya satellite, a new earth station was built at Fort Detrick, Maryland. 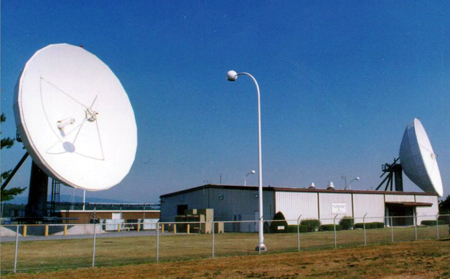 For the Intelsat link, the US used the commercial Intelsat ground station at Etam, West Virginia. Commercial circuits connect these earth stations to the Hotline terminal at the National Military Command Center in the Pentagon. The Soviets originally intended to use an earth station in the suburbs of Moscow for the Intelsat link and a Molniya station at Vladimir. 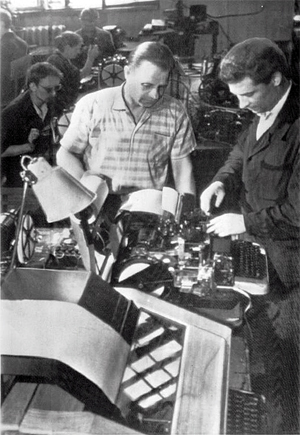 However, because of severe winter weather conditions in the Soviet Union, the Russians constructed a second Intelsat earth station, approximately 50 miles from L'vov, to ensure increased dependability. * Since 1991 L'vov is in Ukraine, so it's likely the Russians moved their Intelsat earth station to another location. 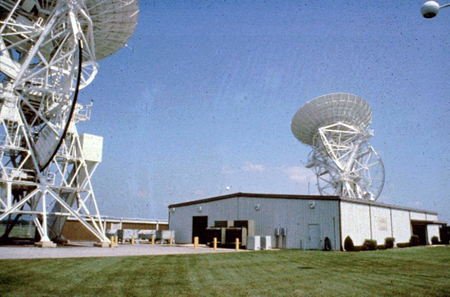 The US ground station at Fort Detrick was built by the Radiation Division of the Harris Corporation, and became operational in the Spring of 1974. Harris operated and maintained the station and its equipment through 1977. Since 1981 Honeywell Technology Solutions Inc (HTSI) provides 24/7 Russian linguist support and technical support for the operation of the Detrick Earth Station (DES), ensuring that the availability is maintained at greater than 99.97 percent. A renewed five-year $8.4 million contract with Honeywell ends in February. with the 1974 dishes for the Russian satellites. 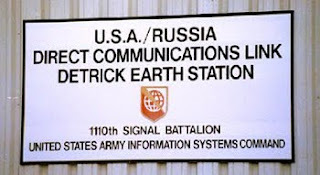 The Detrick earth station was modernized by the Satellite Communications Systems of the US Army in 2007. Outdated equipment was replaced by state-of-the-art systems and new 15-meter satellite dishes were installed. Now the station has a multi-carrier, multi-satellite capability, instead of the previous point-to-point, single-satellite, single-carrier system. The twin satellite dishes are being kept operational by a staff of 16 civilian Army employees: eight technicians and eight linguists. They work around the clock to ensure the system is operating correctly. The station supports not only the Hotline, but also a number of other critical Government-to-Government Communications Links (GGCL) between the United States and Russia. In May 1983, president Reagan proposed to upgrade the Hotline by the addition of high-speed facsimile capability. This was followed by bilateral negotiations, leading to an agreement signed by the United Stated and the Soviet Union on July 17, 1984. This agreement was subsequently updated by an exchange of diplomatic notes in Washington, on June 24, 1988. According to the agreement, at each end of the Hotline facsimile terminals of the same make and model were installed. It was specified that (digital) Group III facsimile units had to be used, operating at 4800 bits per second. Faxes like this take between 6 and 15 seconds to transmit a single page, which was much faster than the 66 words per minute capability of the existing teletype connection. 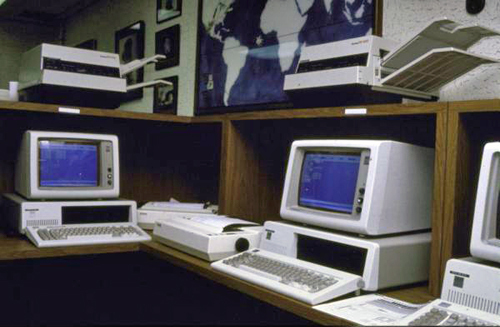 All facsimile equipment was provided by the United States, as well as the IBM personal computers used for the secure orderwire channel to allow coordination between the distant ends. 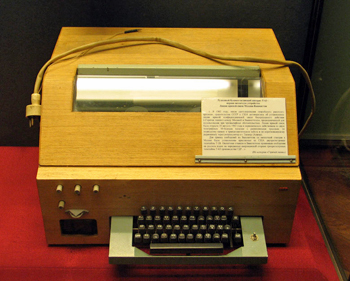 These computer had standard USSR Cyrillic and United States Latin keyboards and "cathode ray tube displays to permit telegraphic exchange of information between operators". Printers had to provide record copies of all information exchanged on the orderwire channel. 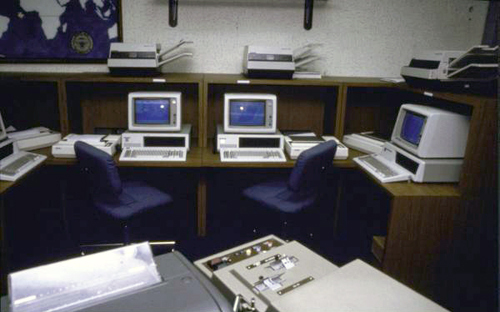 The installation of the new facsimile and computer equipment was completed in the summer of 1985. It was tested and used alongside the existing teletype connection for several years, and after it had proved to be reliable enough, the teletype circuits were turned off in 1988. As part of the facsimile upgrade, the Soviets transferred the Hotline transmissions over to a newer, geosynchronous satellite of the Gorizont-class, which was part of their Statsionar system. This eliminated the US ground station at Fort Detrick from having to hand off the transmissions every four hours between the four Molniya satellites. * In 1996, a new Molniya-3 satellite took over the Russian satellite link for the Hotline. Based upon the 1984 agreement, it seems that the digital data from both the facsimile units and the personal computers were digitally encrypted using the Vernam stream cipher, the same method as was previously used for the teletype transmissions. This encryption was done by "information security devices", which consisted of microprocessors located in computers with floppy disk drives. These combined the digital facsimile output with buffered random data, which was read from standard 5.25 inch floppy disks. It's not clear whether this encryption was done by the IBM computers of the coordination channel, or by separate ones. The agreement said that the United States had to provide a specification describing the key data format and necessary keying material on a floppy disk for both parties, until the Soviets had developed this capability as well. Also, the necessary security devices, as well as spare parts for the equipment had to be provided by the American side, in return for payment of costs thereof by the Soviets. It's not clear for how long the presidential Hotline kept using facsimile machines. 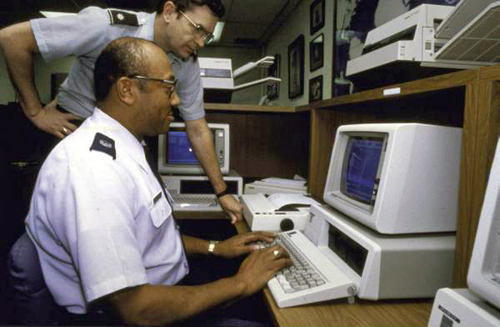 For example, the communication links of the Nuclear Risk Reduction Centers (NRRC) were modernized in 1995, by replacing the facsimile capability with a scanned files transfer (an impression of how this NRRC communication link works will be given later). In 2007 the Direct Communications Link got a fifth upgrade. As we saw earlier, the US earth station at Fort Detrick was modernized and also the link itself was upgraded to a dedicated computer network linking the Washington and Moscow terminals. This network runs over redundant circuits of two existing satellite links and a new fiber-optic cable, which replaced the old back-up cable link. - Test Messages: consisting of apolitical, non-propagandistic texts, usually poems, short stories or other writings dealing with nature, classical music, art or literature. These are transmitted daily: every even hour from Washington and every odd hour from Moscow. - Service Messages: coordinating the operation of the Hotline, about software and hardware issues and also containing a summary of the daily use of the system. These are probably formatted by so called Standard Operating Procedures (SOPs). - Governmental Messages: the messages send on behalf of the presidents of Russia and the United States. From Washington all messages are sent in English, using the Latin alphabet, from Moscow in Russian, using the cyrillic alphabet. Translation is done by the receiving party in order to preserve the nuance of each language. The US terminals are manned by a team of military personnel, headed by a commissioned officer functioning as the Presidential Translator on duty. His primary job is to render into English all messages received through the Hot Line. When a message comes in, he makes a first sight translation to decide if it's so urgent that the president should be called on a secure line to give him an immediate oral translation. If the Russian message is a bit less urgent, the Presidential Translator makes a rough written translation and sends that to the White House via a secure fax, but later a secure network channel. Later on, a final official translation of the message is made in cooperation with State Department translators. for sending a test message at the Pentagon Hotline terminal. The 1985 presidential directive about the operation of the Direct Communications Link ordered two man-rule procedures to be established at all operating locations, to ensure against inadvertent release of the messages. Hotline messages may only be released with explicit approval of the president, and even releasing information about the sole fact whether this link has been used is a presidential prerogative. The Washington-Moscow Hotline was mainly used to inform the other party about sudden movements of their fleet or troops, to prevent that the other could see that as a provocation or preparation of agression. Reportedly, the Hotline was first used by the Americans on the day of the assassination of president Kennedy, November 22, 1963, only a few months after the link was established. This first message was followed by nineteen other transmissions during the Six-Day War of 1967, mostly to inform each other of the intentions and maneuvers of the Soviet Black Sea Fleet and the US 6th Fleet, which approached each other dangerously closely in the Mediterranean. Three of the messages were related to the incident with the American spy ship USS Liberty. In at least two cases, the Hotline was also used in non-crisis situations. President Johnson once ordered a message to be sent to the Soviet Union informing it of the American Apollo spaceship missions, and president Jimmy Carter used the Hotline for a more personal message to Sovjet leader Leonid Brezhnev, but the Russians didn't appreciate that and saw it as an improper use of the Direct Communications Link. It is said that in 1986 president Ronald Reagan used the Hotline to threaten the Soviets over their arrest of the US journalist Nicholas Daniloff on espionage charges. Apparently there were also a few severe crisis situations in which the hotline wasn't used, like when on November 9, 1979 there was a false alarm at NORAD about what seemed to be a full-launch Soviet nuclear strike. Even more critical was the situation during the NATO exercise Able Archer 83 in November 1983, which made the Soviets think the US was preparing a nuclear war. The phone calls which the American and Russian presidents make nowadays, are through the Direct Voice Link (DVL). That's a dedicated phone line between the White House and the office of the Russian president which uses the same satellite link as the Hotline. This phone line seems to be established by an agreement between the US and the Soviet Union in 1990, which was renewed for the Russian Federation in 1999. The Direct Voice Link is meant for routine matters and the calls are usually scheduled in advance, so interpreters can be present. * This voice link is not part of the Washington-Moscow Hotline. By agreement only the latter is designated for top level crisis communications. The Washington-Moscow Hotline is often called the Red Phone, because many people think it's a phone line with a red handset on each side. As we have seen this was never the case - even though Wikipedia articles in almost every language say so up to this day. Also president Obama used the popular myth of the red phone, when at a joint press conference in June 2010, he joked about how social media might help to move past the traditional Cold War communications. Speaking of the Russian president Medvedev starting a Twitter account, Obama said: "I have one, as well, so we may be able to finally throw away those red phones that have been sitting around for so long". 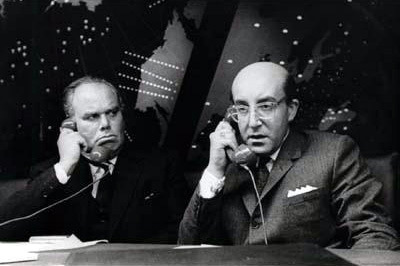 The image of the red phone is derived from many books and movies, in which world leaders call each other with a red phone to discuss a crisis, for example the 1964 movie Fail Safe, which was also based on the 1958 novel Red Alert. Because only very few people knew how the actual Hotline worked, also many US government officials assumed the direct communications link was a phone line. This confusion is probably also caused by the fact that the White House and the military did use red phones, not for international, but for internal communications. Quick and easy contact between the president and the military command centers is of course just as important as contact with the Kremlin, and this is achieved through a secure military telephone network, called the Defense Red Switch Network (DRSN). For this network, a number of different handsets have been used, including a red one without a dial in the early years. * These real red phones will be discussed on this weblog later. A more correct picture of a red telephone used for internal crisis communications was also seen in popular culture, like in the 1966 Batman television series (showing the Batphone) and the James Bond films, in which the head of MI6 uses a red phone to communicate with the prime minister and military officials. 1967: Ancillary terminal installed at the White House. 1978: The land line replaced by a satellite link. 1980: Old teletype and encryption machines replaced by newer ones. 1988: Teletype equipment replaced by facsimile units. - 2011 article by the Voice of Russia: Hello, Mr. President! - Michael K. Bohn, Nerve Center. Inside the White House Situation Room, Brassey's Inc, Washington DC, 2003, p. 89-96. - Paul E. Richardson, The hot line (is a Hollywood myth), in: Russian Life, September/October issue 2009, p. 50-59. - Leland McCaslin, Secrets of the Cold War: US Army Europe's Intelligence and Counterintelligence Activities Against the Soviets, Helion, Solihull 2010, p. 111-114.